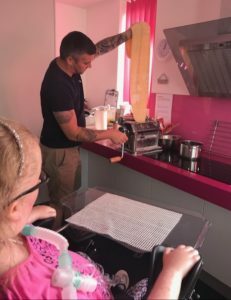 The wonderful Rob from Rubino Kitchen gave up his time to teach Rebecca to cook. Her parents said: “We just had an amazing lunch cooked by Rob! 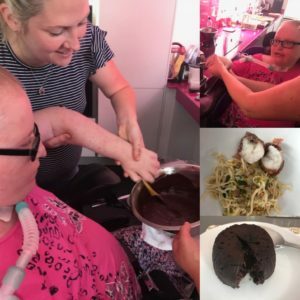 He was so patient and lovely with Bex and showed her how to make pasta and a gorgeous chocolate fondant. We held her hand and she ‘helped’ to make things. She loved it. Especially all the sitting around and eating it afterwards! We’re so grateful to ambassador Sarah for arranging this. My husband and I are also looking forward to visiting Rob’s restaurant again”.